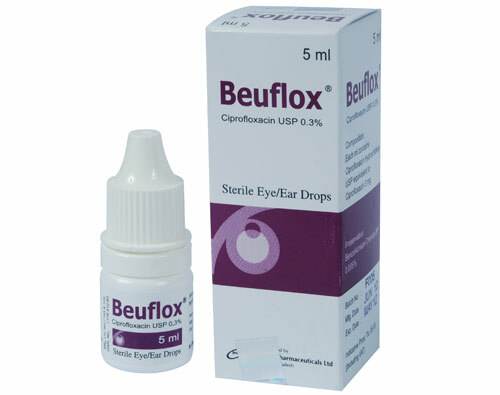 Beuflox sterile eye/ear drops: Each ml contains Ciprofloxacin Hydrochloride USP equivalent to ciprofloxacin 3 mg.
Beuflox eye/ear drops (Ciprofloxacin Hydrochloride ophthalmic solution) is a synthetic, sterile, multiple dose, antimicrobial for topical use. Ciprofloxacin is a fluoroquinolone antibacterial active against a broad spectrum of gram positive and gram-negative ocular pathogens. It is available as the monohydrochloride monohydrate salt of 1-cyclopropyl-6-fluoro-1,4-dihydro-4-oxo-7-(1-piperazinyl)- 3-quinoline-carboxylic acid. It is a faint to light yellow crystalline powder with a molecular weight of 385.8. Its empirical formula is C17H18FN3O3.HCl.H2O. Otitis externa, acute otitis media, cronic suppurative otitis media. Prophylaxis in otic surgeries such as mastoid surgery. Corneal Ulcers: The recommended dosage regimen for the treatment of corneal ulcers is 2 drops into the affected eye every 15 minutes for the first 6 hours and then 2 drops into the affected eye every 30 minutes for the remainder of the first day. On the second day, instill 2 drops in the affected eye hourly. On the third through the fourteenth day, place 2 drops in the affected eye every four hours. Treatment may be continued after 14 days if corneal re-epithelialization has not occurred. Conjunctivitis: The recommended dosage regimen for the treatment of bacterial conjunctivitis is 1 or 2 drops instilled into the conjunctival sac(s) every 2 hours while awake for 2 days and one or 2 drops every 4 hours while awake for the next 5 days. For all infections, 2-3 drops every 2-3 hours initially, reducing the frequency of the instillation with control of infection. Treatment should be continued at least 7 days. The most frequently reported drug related adverse reaction is local burning or discomfort. In corneal ulcer studies with frequent administration of the drug, white crystalline precipitates were seen in approximately 17% of patients. Other reactions occurring in less than 10% of patients included lid margin crusting, crystals/scales, foreign body sensation, itching, conjunctival hyperemia and a bad taste following instillation. Additional events occurring in less than 1% of patients included corneal staining, keratopathy/keratitis, allergic reactions, lid edema, tearing, photophobia, corneal infiltrates, nausea and decreased vision. As with other antibacterial preparations, prolonged use of ciprofloxacin may result in overgrowth of nonsusceptible organisms, including fungi. If superinfection occurs, appropriate therapy should be initiated. Ciprofloxacin should be discontinued at the first appearance of a skin rash or any other sign of hypersensitivity reaction. Pregnancy Category C. There are no adequate and well controlled studies in pregnant women. Beuflox eye/ear Solution should be used during pregnancy only if the potential benefit justifies the potential risk to the fetus. It is not known whether topically applied ciprofloxacin is excreted in human milk. Caution should be exercised when Beuflox eye/ear Solution is administered to a nursing mother.